Inevitably, pictures of breeds tend to be idealised and this one by Julie Brennan is no exception. It is also somewhat androgynous, a characteristic that, as we shall see, is not desirable. It is a dog but both head and body, although excellent, are refined and do not exhibit quite the strength that one would expect of a male. But it does give a ‘feel’ of the breed. It is dog that is alert and ‘ready to go’. They do not need to bark but many will be excited in the ring and it is not a fault – however irritating. The breed barks to attract the attention of the hunter once game has been found so if you want to judge it – you have to put up with it! 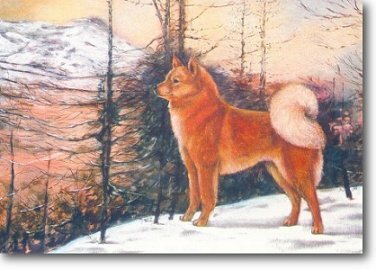 The pictures in this presentation are of Finnish dogs and have all been taken from Judging the Finnish Spitz by Anti Arnio.